The Jordan Forum for Business and Professional Women (JFBPW) helps women establish and grow successful businesses in Jordan. USAID's support for business associations, such as the JFBPW, is creating a business environment where micro and small enterprises can flourish. 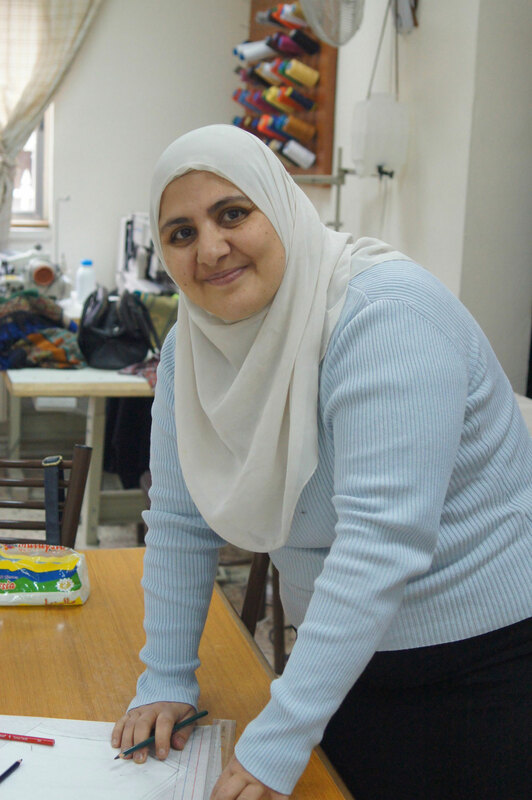 Safa Ghaith works from home as a seamstress performing alterations and clothing repairs. She is learning to design and make clothes at a JFBPW-supported training center and plans to expand her business. In a training center in East Amman, women gather around a large table to measure and draw clothing designs. Teachers demonstrate techniques and make suggestions while the students practice on their own projects. One student, Safa Ghaith, quietly works off to the side, intently crafting a dress design. Safa usually works from home as a seamstress, performing alterations and clothing repairs, but she has bigger plans for her business. Safa is participating in a training program at the Jabal Al Taj Training Center. The Center is run by the Jordan Forum for Business and Professional Women (JFBPW). Established in 1976, JFBPW empowers business and professional women with the aim of increasing their contribution to the Jordanian economy. The training programs at the Jabal Al Taj Center, provided in partnership with the Jordan National Employment, Technical and Vocational Education Training Fund, teach women textile and clothing design, sewing, embroidery, hairdressing, and information technology skills. The programs also cover business topics, such as how to access finance, register a company, and market products. Women own less than 10 percent of micro and small businesses in Jordan. Those wanting to start a business find it difficult to access finance, face social and cultural barriers to their participation in the economy, and lack the necessary networking and mentoring opportunities to be successful in the male-dominated business environment. JFBPW helps women overcome these challenges through training and by providing invaluable connections with established entrepreneurs who can provide advice and business contacts. 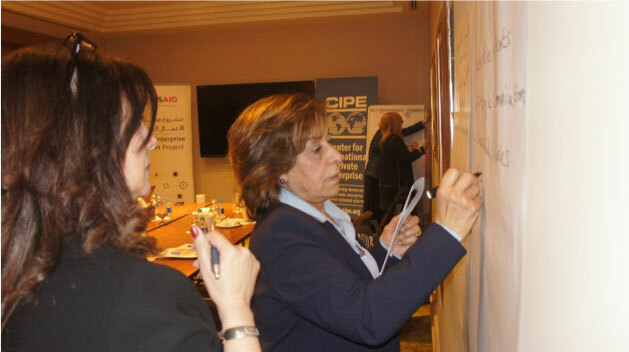 The Center for International Private Enterprise (CIPE) has been helping the JFBPW increase its organizational effectiveness so that it can better support aspiring businesswomen in Jordan. CIPE’s work with the JFBPW is made possible by a grant from FHI360 under the USAID Jordan Local Enterprise Support Project. With CIPE’s support, the JFBPW has developed a strategic plan, increased fundraising, and improved its governance. These efforts have led to strong growth for the organization, including a 37 percent increase in membership over the last year. As a result, the organization has been able to improve the services it provides, including undertaking much-needed renovations to the Jabal Al Taj Training Center and upgrading its training programs through cooperation with organizations such as the Amman Design Institute. JFBPW members Mayyada Musa Salem (left) and Hiba Qandeel (right) drew on the association’s support and services to expand their businesses. JFBPW member Mayyada Musa Salem knows first-hand the crucial role business associations play in supporting fledgling entrepreneurs. When Salem started her construction company in 2009, it was the only solely female-owned construction business in Jordan. The biggest challenge she faced was skepticism that a woman could succeed in the industry. “No one thought I could do it.” The networking opportunities and informal, word-of-mouth marketing provided by fellow JFPBW members was what gave her the early boost she needed to grow her company. Today she employs five staff members and plays a leadership role in the industry. 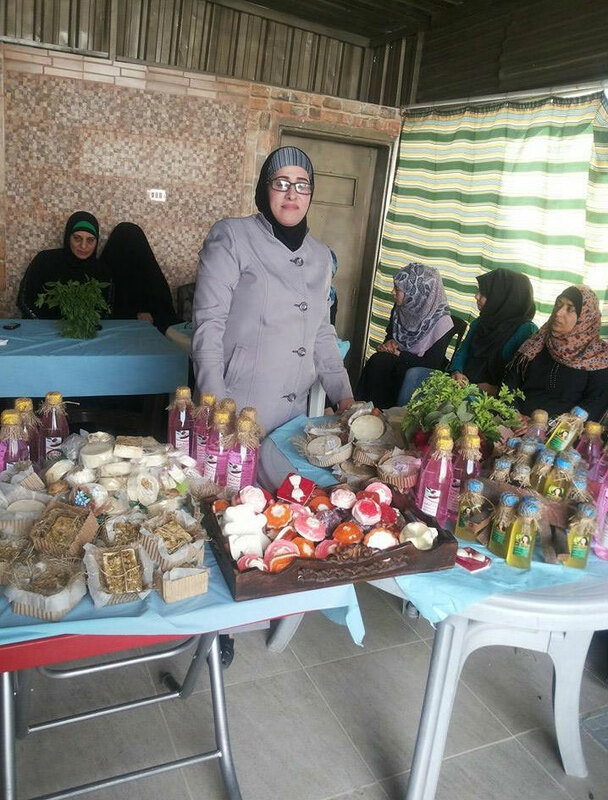 Fellow JFBPW member Hiba Qandeel, owner of HIbat Al Tabee’a (Gift of Nature), a natural herb and food products company, also leveraged the networking and exhibition opportunities provided by the Forum to find new markets and expand her company. “Through networking and participating in JFBPW conferences and exhibitions, I was able to access new markets and grow my business.” What began as a home-based business in 2006, today consists of three factories and 20 employees, and exports products to Kuwait and Saudi Arabia. Dressmaking and design trainee Safa Ghaith is hoping she can follow in the footsteps of these more established businesswomen to grow her business, contribute economically to her family and community, and achieve her dreams. “I want to be someone,” she says. “I want to make a name for myself.” As the JFBPW continues to grow and expand its services, more women like Safa will receive the support they need to make their dreams of owning a business a reality.